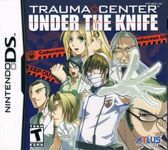 Trauma Center: Under the Knife is a medical simulation game with some sci-fi elements. You play as Dr. Derek Stiles, a new O.R. doctor who is looking to help anyone he can after losing his father to an incurable illness. A new disease named GUILT (Gangliated Utrophin Immuno Latency Toxin) has popped up and is spreading rapidly. Will Dr. Stiles be able to help eliminate this disease?